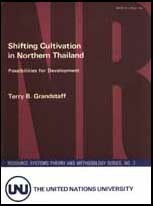 Terry B. Grandstaff is a Behavioral Science Advisor with the United States Agency for international Development in Bangkok, Thailand. This study was sponsored by the Technology and Development institute of the East-West Center, Honolulu, Hawaii, USA. Some of the research used was sponsored by the Culture Learning Institute of the East-West Center. The study was a part of the Technology and Development Institute's Project in Renewable Resources Planning and Development, Kenneth Ruddle, Director. The author also wishes to acknowledge the assistance of the Tribal Research Centre, Chiang Mai, Thailand, Mr. Wanat Bhruksasri, Director. The concepts and interpretations expressed in this monograph, however, are the sole responsibility of the author. The study has no connection whatsoever with the United States Agency for International Development. Chapter 3, The Development of Swidden Agriculture, is largely based on the author's article of the same title published in Development and Change, volume 9, number 4 (London, 1978). It appears here by kind permission of the publishers, Sage Publications. This report was published within the framework of the United Nations University's Programme on the Use and Management of Natural Resources. The views expressed are those of the author and not necessarily those of the United Nations University. 1.2. Who are the swiddeners (and why are people saying such terrible things about them)?